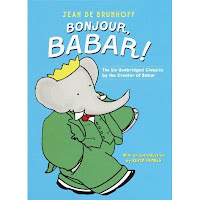 One of Z's favorite books that he received at Christmas is Bonjour, Babar. This book contains the six original Babar books written by Jean de Brunhoff between 1933 and 1940 before his tragically young death at age thirty-seven (tuberculosis). They are The Story of Babar, The Travels of Babar, Babar the King, Babar and Zephir (which we enjoyed last year from the library), Babar and His Children and Babar and Father Christmas. This is a reproduction of the six books so they begin with the full title page and have the same layout of text and illustrations as the original books. This edition also has an introduction by Kevin Henkes, who some of you know from Lilly's Purple Plastic Purse and our recently reviewed Old Bear. He writes about his connection to Babar and how it influenced his journey into becoming a picture book author. 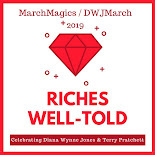 This is a wonderful collection and a perfect gift for a growing child's library. Babar teaches responsibility, exploration and love. Buy Bonjour, Babar! : The Six Unabridged Classics by the Creator of Babar on Amazon or find it at your local library.